What Is Pete Seeger-Style Banjo? Pete Seeger has been getting people excited about playing the banjo for over 70 years now. He’s one of the most eclectic banjo players on the planet, playing a wide variety of music from all over the world on the instrument. In 1948, he authored the first-ever banjo instructional book, How to Play the 5-String Banjo, and this amazing book (published by Pete himself) is still in print today. The style that bears his name is just one of many ways that Pete plays the banjo, and although he’s the musician most responsible for popularizing this playing technique, he didn’t invent it. Seeger style is a widely played variation on clawhammer technique that he likely first heard North Carolina old-time musician Samantha Bumgarner play back in 1935. Pete probably liked what he heard, learned to play Samantha’s way, and soon after popularized this technique among players all over the world. Sometimes, just a slight variation in playing technique leads musicians to view a particular way of playing as a distinct style. 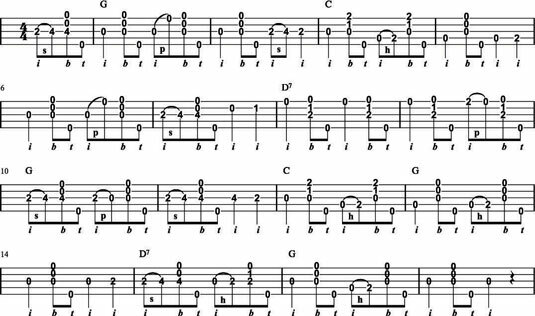 Pete’s right-hand approach is very similar to standard clawhammer banjo but with one crucial difference: The right-hand-index melody note is picked up instead of played in a downward motion across the melody note string as in clawhammer banjo. More than a few old-time players prefer this way of playing to the all-down stroke method of conventional clawhammer banjo, and there’s no question that it’s possible for experienced players to play really, really fast using this technique (and what’s not to love about that?). It’s best to give Pete’s variation a try and see whether it works for you, keeping in mind that most players today are completely happy using the more conventional clawhammer technique. Pick up (not down!) with the right-hand index finger, either on the 1st, 2nd, 3rd, or 4th string, as indicated in the tablature. The index finger in this case is moving up toward the 5th string. Brush down with the right-hand middle finger across the top three strings, as in conventional clawhammer technique. You can brush all three strings, just the top two strings, or even just the 1st string by itself. Play what sounds good to you! Strike the 5th string with your right-hand thumb, moving across the string as in conventional clawhammer playing. Check out the tab here as well as the audio track Seeger Basic Strum and the video clip Old-Time Banjo: The Seeger Stroke to get familiar with Pete’s unique old-time banjo style. 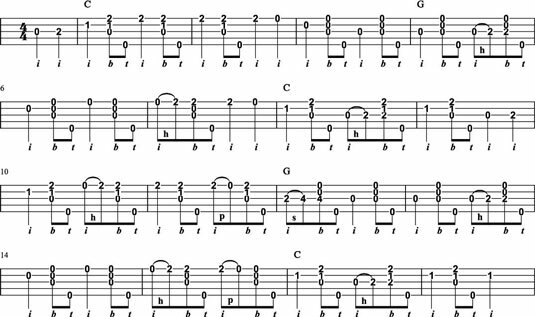 It takes some getting used to but once you get the hang of it, you’ll likely find it to be a fun-to-play variation on basic clawhammer technique. Seeger’s basic strum, picking up with the right-hand index finger. Here is the tab for another tune, “Little Birdie.” This tune is recorded for you on the audio track “Little Birdie” Using Seeger Stroke. “Little Birdie” is an old-time vocal favorite, often played in the key of C. The chorus lyrics are “Little birdie, little birdie/Come and sing to me your song/I’ve a short time to stay here/And a long time to be gone.” Ralph Stanley has recorded several great versions of this classic. Note that both of these tunes can also be played using conventional clawhammer technique by just moving downward across the melody note string with the right-hand index finger, instead of picking up.